Heat a frying pan over medium-low heat. Toast cashews and sunflower seeds until fragrant and lightly browned, tossing often to avoid burning. Bring water to a boil in a pot and salt generously. Cook tagliatelle according to package instructions or until al dente. Drain. In the meantime, pluck wild garlic leaves from stems and tear leaves into the food processor. Add toasted cashews and sunflower seeds, Parmesan cheese, olive oil, season with salt and pepper to taste, and blend until smooth. 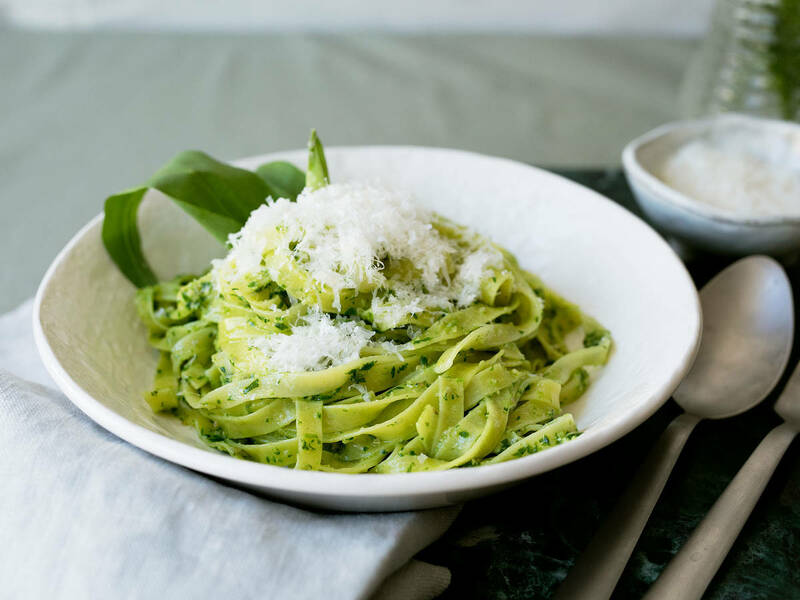 Combine drained tagliatelle with wild garlic pesto. Serve with freshly grated Parmesan cheese and more wild garlic leaves. Enjoy!